A couple years back the lady and I attempted to try every pumpkin ale that was available on the shelves at our favorite local beermongers. A lot were "meh!" and a handful were pretty good. One of the ones that left a memorable tasty impression was Southern Tier imperial ale PumKing. 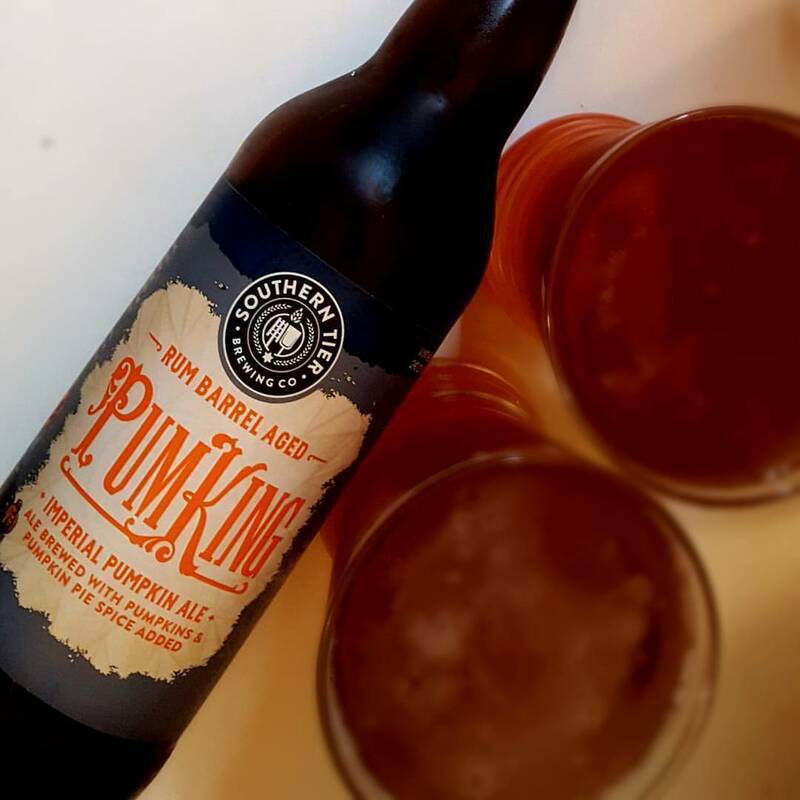 While out shopping for a few pumpkin ales to have this year, we spotted this one the shelf. "Look, honey" I said as my eyes lit up. "It's not just PumKing. It's a rum barrel aged PumKing." I think I even did a little happy dance when I took it up to the counter to cash out. Pouring a translucent burnt orange in color and a very minimal head it looks like the autumn season. Aromas of nutmeg, cinnamon, and pumpkin were right up front and backed with oak and a slight hint of rum. The rum becomes more pronounced in the flavor. On first sip, a sugar cane sweetness, some oak smoke and a smidge of alcohol hotness from the barrel aging sit front and center. Surrounding that is allspice, nutmeg and a buttery crust. Giving it a little more time to breathe, these flavors intermingle a bit more, giving space for some more pumpkin to come out in this medium bottle brew. A warming effect that comes over from the taste and smell stays consistent all the way through. Finishing slightly dry but with a rum and pumpkin sweetness is an interesting twist as it lingers for a bit but isn't ever too obtrusive. We have drank way fewer pumpkin ales this year than we have in the past and the only one that we have sipped more than one of this year has been this particular brew. If we were to find another bottle somewhere, we'd most likely buy it and savor it for a third time too.